I got a handful of really awesome Christmas gifts this year and I wanted to share the beauty related ones I got with you. If you want a full review on any of the products as I really start trying them out in the next few weeks let me know in the comments below. 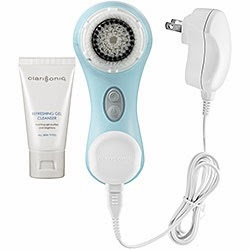 First off, my big present was the Clarisonic Mia 2. It was a set from Sephora that came with the Fresh Soy Face Wash and the Lotus Youth Preserve Face Cream With Super 7 Complex - also the brush head is the sensitive one. Haven't put these face products to the test yet because I want to use my normal skincare as I implement the Clarisonic into my routine. I've been using it every night since I got it and I can really feel the difference in how clean my skin feels. I can tell I'm already heading into the breakout phase because it's very deep cleaning and it's been purging. I will do an update in a month and let you guys know how my acne/redness is doing. I'm attaching a picture of it from the Sephora webpage because I don't have my camera with me up north and as you can see it's not the same set as mine so maybe that was a limited edition set with Fresh. I also got the hot pink colour of it. 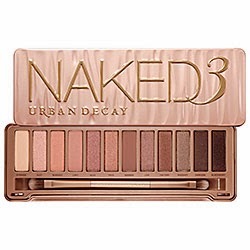 Next I got the Naked 3! I'm so thrilled and I don't have any swatches for you but you can google it to find 100s of photos of this palette. It's everything I hoped for and more. All the shades show up really well on my fair skin and I think it can work for so many different people. I love using the shade Trick all over the lid, and then limit/nooner mixed together in the crease. If I'm going more dramatic with it I'll pull in some dark shades like Factory and use Blackheart as a liner. I got the Nars Guy Bourdain blush palette that I mentioned before previously in my wishlist. I don't want to post too much about it because it was limited edition and it is obviously sold out. It's perfect because it has 4 blushes, one highlighter and a bronzer - i love the formulation and the shades are gorgeous. Lastly, I received the 500pt perk from Sephora that was the Kate Somerville package. It comes with the Oil Free Moisturizer (0.5 oz), ExfoliKate Intensive Exfoliating Treatment (0.25 oz), Detox Daily Cleanser (2.0 oz). I've always wanted to try out the products and these sizes are actually very big. So far I've only tested out the cleanser for a few mornings and I have no complaints. I'll be testing these out in the future and will let you know if I'd repurchase any of this.